With an excellent reputation for guiding and hospitality, African Bush Camps is perfectly positioned to offer a superb Botswana safari. Their unique style offers a true and honest safari experience with all the modern day elements of comfort whilst maintaining an authentic view of the old untouched Africa. Their portfolio of camps in Botswana are located within remote areas, and cater to smaller more exclusive groups where guests are guaranteed to feel special, well looked after and most of all, part of the family. 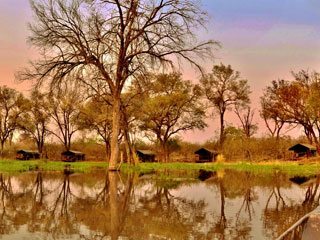 Their flagship camps in Botswana comprise of Linyanti Bush Camp and its neighbouring family-focused camp, Linyanti Ebony. Providing guests with elegance and expert guiding, these two camps are located on a private concession and are reflective of the good name and incredible guest experiences which African Bush Camps has long been associated with. Between April and November, guests staying at either of these two camps have access to a half hour scenic flight of the Linyanti Marsh, allowing for a unique experience and view of the Linyanti area. Set up along the edge of a lagoon feeding into the Khwai River, Khwai Tented Camp offers a simple yet stylish safari experience in one of the most consistent areas in Botswana for wildlife sightings year round. Located within the Khwai Community area and on the outskirts of the Moremi Game Reserve, the area offers one of the most successful examples of a community living in peaceful co-existence with wild animals, and is reflective of sustainable tourism models whereby communities are benefiting directly from tourism.